SPARKS, MD (September 25, 2014) – GearWrench®, a premier hand tool brand from Apex Tool Group, known for tools that deliver speed, strength and access, today announced the launch of several new GearWrench Screwdrivers. The new GearWrench Torx screwdrivers feature longer six-inch blades for improved access in cramped spaces. And for the first time, GearWrench is offering a selection of Tamper Proof Torx screwdrivers with 6” blades as well. GearWrench is also introducing an extra-long 24-inch combination set and a long (16 and 20-inch) combination set. The components of both sets are also available as open stock. All new screwdrivers feature dual material handles for comfort and enhanced performance. The handles are resistant to oil and solvents, further extending the life of the tools. They also feature a ribbed, narrow-diameter “speed zone” section of the handle that allows fast fingertip turning in low-torque situations. The black oxide non-slip tips and laser etched part numbers and sizes make these screwdrivers must-have tools for every garage. 7-Piece Torx Screwdriver Set – this set features six-inch blades and is available in T-10, T-15, T-20, T-25, T-27, T-30 and T-40. 7-Piece Tamper Proof Torx Screwdriver Set – this set features six-inch blades and is available in T-10, T-15, T-20, T-25, T-27, T-30 and T-40. 2-Piece Extra Long Combination Screwdriver Set – long reach applications are no longer a challenge with this new set. Screwdrivers include #2 Phillips and ¼ inch slotted with 24-inch shafts. The shafts are heat treated to prevent bending. 4-Piece 16” and 20” Combination Screwdriver Set – this set features high quality long screwdrivers to meet the most demanding end user requirements. It includes 16-inch #2 Phillips and 3/8 inch slotted as well as a 20-inch #2 Phillips and 3/8 slotted. 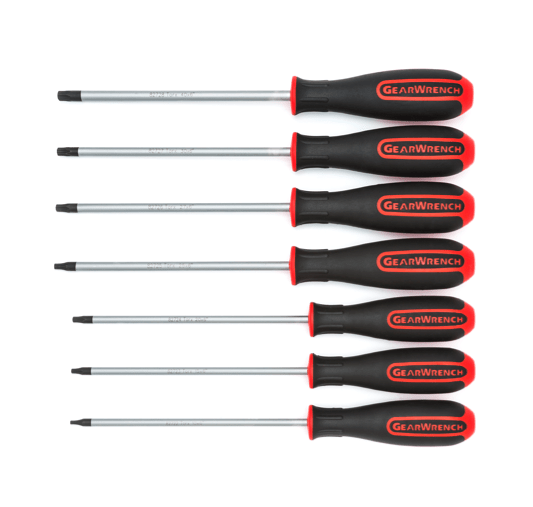 The new screwdrivers are available for purchase in the sets listed above or as open stock from mobile distributors and automotive parts retailers nationwide. For more information visit www.gearwrench.com. Apex Tool Group, LLC, based in Sparks, MD, is one of the largest worldwide producers of hand and power tools, tool storage, drill chucks, chain, and electronic soldering products. Directly and through its subsidiaries, Apex serves a multitude of global markets, including automotive, aerospace, electronics, energy, hardware, industrial, and consumer retail. Apex markets its portfolio of diverse products under its own brand names in addition to being the principal manufacturer for several key private label products for certain retailers for many years. Additional information about Apex Tool Group is available at www.apextoolgroup.com.